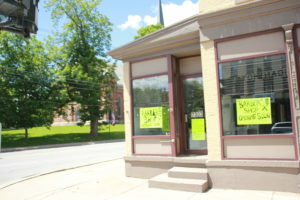 LIMA – After weeks of advertising, CJ’s Barber Shop on Lima’s four corners officially opens July 6. Owner Cindy Montes, who has 14 years experience cutting hair, hopes the shop will provide a necessary service to Lima and the surrounding area. Although Montes says the barber shop will focus on men’s cuts, she will also provide women’s and children’s cuts, but no coloring or perms. Montes says that hers is an ideal location. Her clientele are eager to see her open. Montes is already seeing local interest grow. Even before official opening day, Montes was giving her first haircuts. “I wasn’t open today really, but there were people who came in and I’m like, ‘Yeah, okay I’ll cut your hair.’ I did like four or five haircuts,” said Montes. Montes said that one of her focuses is having deals and something for clients to do while she is cutting hair. Although CJ’s Barber Shop will officially open July 6, Montes will be having a grand opening about Sept. 9 to showcase the shop. “I’ll have a grand opening then and then I’ll have everything organized the way I want and I’ll do giveaways and stuff like that,” said Montes. The barber shop’s hours will be 9 a.m. to 5 p.m. on Tuesdays, Thursdays and Fridays, 10 a.m. to 6 p.m. on Wednesdays and 8 a.m. to 12 p.m. on Saturdays.